If news can be fake and facts have alternatives, how are we to know what’s true anymore? Does a post-truth politics tilt toward tyranny? 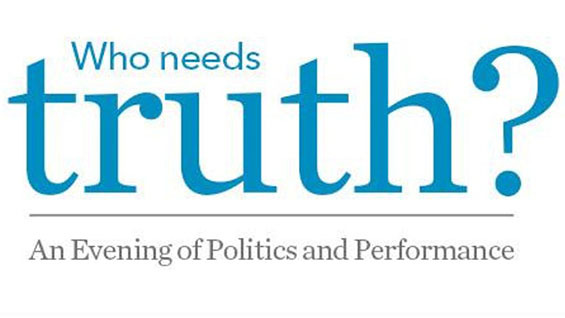 Join the Aspen Institute, The Cooper Union, and the Public Theater’s Public Forum for an evening featuring Harvard University Professor Michael Sandel leading a public debate on the multi-faceted concept of truth in our society. Sandel will be joined by poet Elizabeth Alexander; actors Danny Burstein (Fiddler on the Roof); Brandon Victor Dixon (Hamilton); John Lithgow (The Crown); dancer, actor and recent Kennedy Center Honoree Carmen de Lavallade; immigration activist and Pulitzer Prize winning journalist Jose Antonio Vargas, and others, who will set the stage with thought-provoking readings and performances. The event is free and open to the public. The general public should reserve a space. Please note seating is on a first come basis; an RSVP does not guarantee admission as we generally overbook to ensure a full house. The house will open at 6:45 p.m; at 7:20 p.m., those on standby will be allowed to claim any remaining seats, so please plan a timely arrival. Presented by The Cooper Union and the Aspen Institute in association with the Public Theater.